On 09th November 2016 the ACADEMIC CLUB-IP of our college organized an a general quiz competition for all the thinkers and knowledge seekers of our college. It was named as “AROUND THE WORLD”. 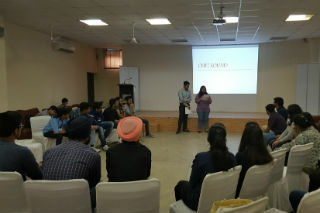 The participation was a bit lesser than the expected number but still all participants enjoyed a lot. There were Thirteen teams of two members each. The event was as usual scheduled at 12Non in Audi-Bld-A. Participants were given Ten minutes to gather at the venue. After Ten minutes the registration for the teams was done and hence each team was given a specific number. First round for the event commenced around 12.20 pm. It was a “‘Hidden Image in Logo’ round. In this a logo of any brand which is popular among Indian society was displayed for each team and then the team had to find a hidden image & Tag Line of that logo. Total marks for this round was 20, If a team is able to identify only image than 10 marks would be awarded, and if a team is also competent to tell the tag line than 10 marks for the tag line would be awarded which makes the total 20 & vice versa. 11 teams cleared the first round, and reached our second round, The second round was called General Quiz, in which a question from general knowledge was asked to each team, total marks for this round was 10,the one who gives the right answer scores highest points and makes it into the next round. Only 5 teams were selected for round Three. Third round was called “ Chit Round”, in this round each team had to pick one paper chit out of 5 chits, every chit had a serial number which is directly proportional to the category displayed on the projector screen. There were Five categories composed of Five different areas like Computing, Politics, Sports, Economics and Indian History. 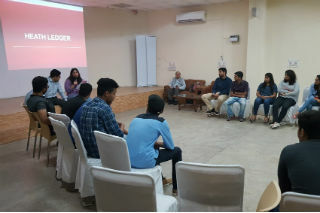 Every team had to answer Ten questions based on their chit category and team who gives the maximum right answers scores highest points and ranked accordingly. 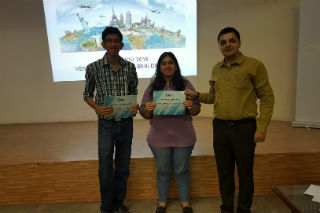 We got our clear winners in this round as Arpit Kalra and Sachin of BCA First year for the First position .But for the second & Third position we had to give a tie breaker question which was won by Anshul and Rahul of BCA Final year for Second Position and for the third position we had Deepali & Deepshika from BCA Final year. 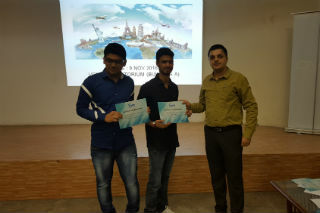 At the end, the winners were felicitated by our Head faculty of Academic Club: Dr.Deepak Chahal and also the winners were awarded with cash prize, and certificates of appreciation. Event ended by 2 pm as per the schedule.